Can the stove be placed anywhere? A free standing stove, can be basically installed in any interior. Under one condition however, you must have a draft pipe of suitable dimensions, which will be discharged through the exhaust and smoke from the fireplace. Freestanding stoves are not devices that require highly specialised skills. The installation of the stove is not at all difficult either, and the installation companies do not charge too much for their services either, therefore hiring them is easily affordable. 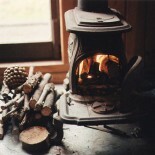 The stove should be placed in a specific place (near the draft pipes and on a non-flammable floor) thus connected to the chimney. At the back of the stove, you can find a draft pipe: which may be directed either upwards or backwards towards the back wall, once again. The stove is connected with the chimney by a steel draft pipe, of which the diameter should correspond to the standpipe near the stove. The stove chimney draft should have a special section, as specified by the manufacturer manual. Therefore if in doubt, relate to the manual. This entry was posted on May 15, 2014 by jbellamy1 in Stove, Uncategorized.